The foregoing is virtually a page-by-page description of the book. Includes the original slokas. 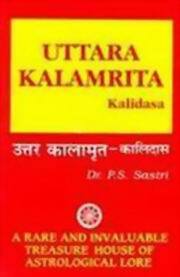 In the introduction, we learn that the author of this book was not the Kalidasa of legend. The real author might have been one Abhinava Kalidasa, but in any case was South Indian, belonging to the 17th or early 18th centuries, a devotee of the Great Mother goddess, Para Shakti, Maha Tripura Sundari. Notable in this book: A method of finding past, present & future births, different from the one given by Varahamihira. An original & simple method for solar return charts, different from the Tajika method. An elaborate account of Rahu & Ketu. An interpretation of retrograde planets in their exaltation & debilitation. Mutual periods of Shani & Shukra. Muhurta & nimitta. Guru & Shani as co-workers. Jaimini's system simplified. Horary astrology & lost or unknown dates of birth. Bibliographic Information: 264p., Tables; Figures; Notes; 22cm.